Our family had a fun, although rather subdued, holiday season. 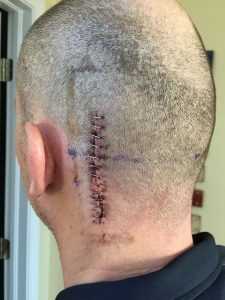 Dave had a pretty major surgery Thanksgiving week — a procedure called a “microvascular decompression” — and he’s been home recovering with the family for the month of December. Because of that, we kept our social calendar pretty empty: we didn’t have our traditional holiday open house for the first time since 2008 (when I was TDY for much of December), and we didn’t go to any of the holiday parties to which we were invited…except for the Boy Scout party for the kids. That one was definitely our speed. Dave’s parents visited for a week right after Dave came home from the hospital. By this point Dave wasn’t able to do much, so his parents enjoyed a relaxing week. For this new year, I’ve taken the advice of a fellow GeekMom writer and tried to come up with a single word to direct my efforts. My word for 2017 will be “Return”. “Return” to work (hopefully), “Return” to writing (for this blog and for GeekMom), and “Return” to my exercise habits that I’ve allowed to falter in 2016. Here’s some photos and stories of our holiday season, enjoy! 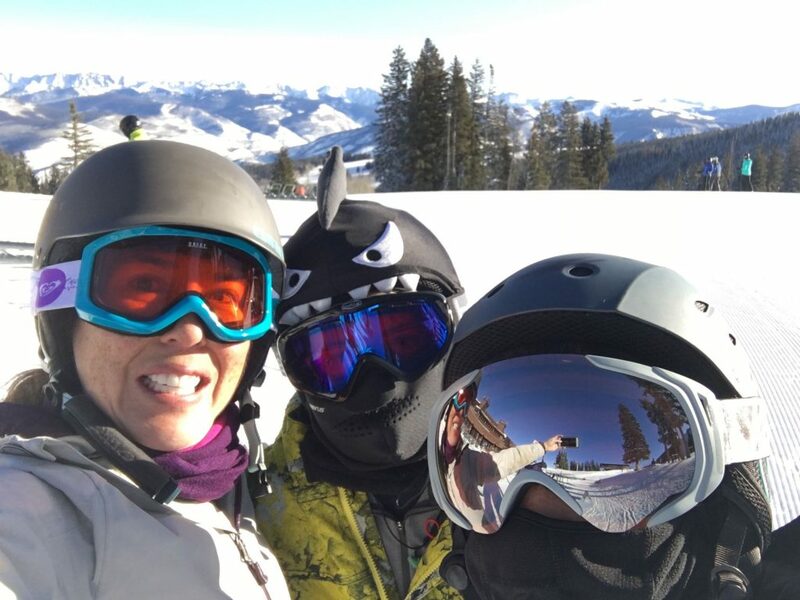 On Christmas eve the family headed out to the mountains, where we had a condo reserved in the town of Avon, between the Beavercreek and Vail ski resorts. 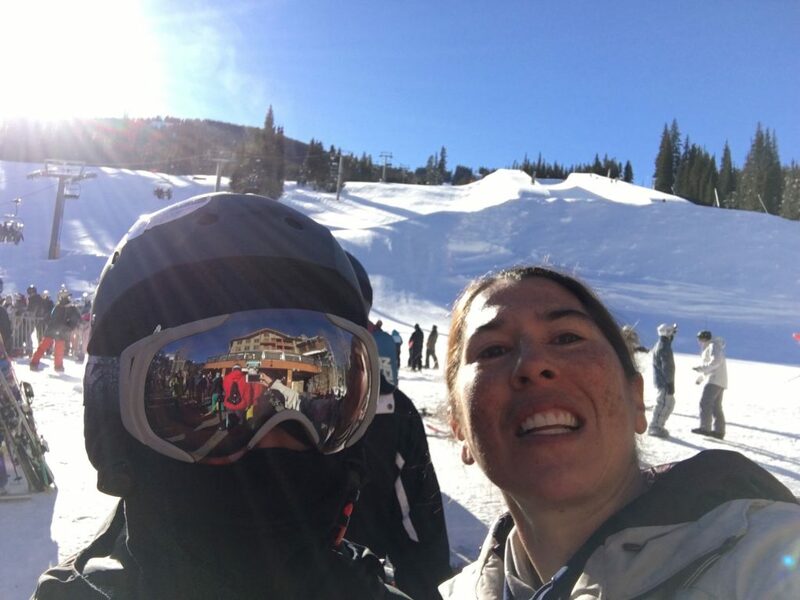 Dave and I had made the arrangements last February, not knowing that Dave’s surgery would keep him off the slopes through the holidays (he’s cleared to ski again in February). Nonetheless, we headed out to the mountains anyway and the boys and I skied for three of the days. Dave ended up catching the flu, which Timmy had the week prior. He was in pretty bad shape the first 3 days of the trip, but once he improved he still had an enjoyable time. 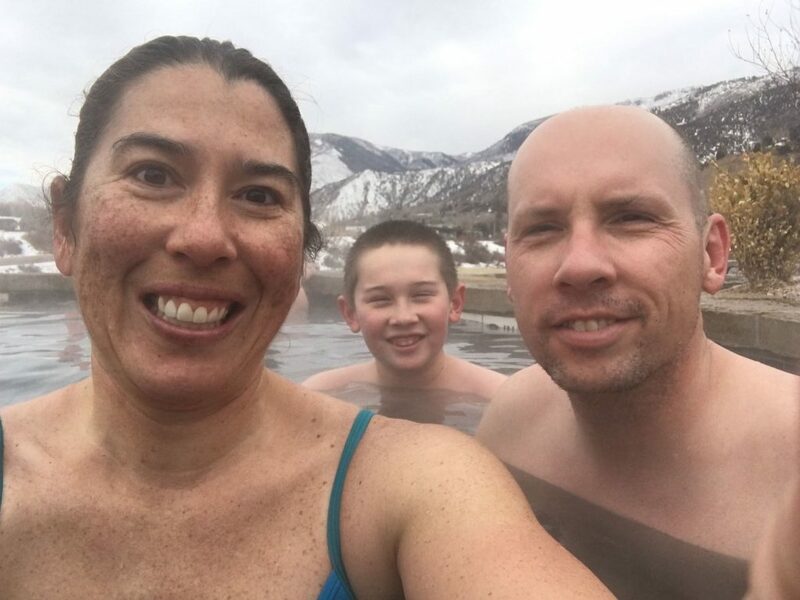 We also spent a day soaking in the mineral pools in Glenwood Springs, which was fun for the whole family! 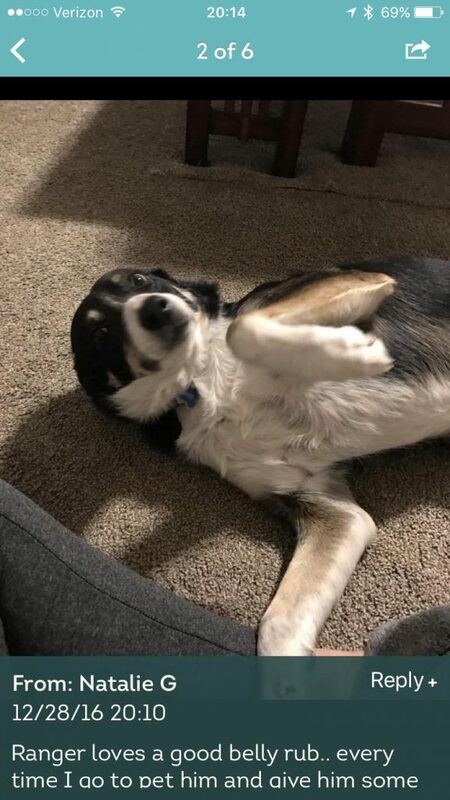 Ranger was with a pet sitter in town, since pets weren’t allowed at the condo. He really enjoys hanging out with Natalie and her family, which includes a young German shepherd. During one of Dave’s “flu days”, I took the boys up the mountain to Beavercreek Ski Resort. It’s a good-sized mountain with a very “elegant” feel to it. For starters, there are much less snowboarder there. We don’t snowboard (believe me, I tried!) but we’ve grown accustomed to the snowboarders at the smaller mountains we visit. The conditions were rather icy, which was a new skiing experience for the boys; I made it clear it was just like skiing on the east coast! We fell in love with an area at Beavercreek called the “Rose Bowl”. The intermediate trails were well-groomed and not too crowded. 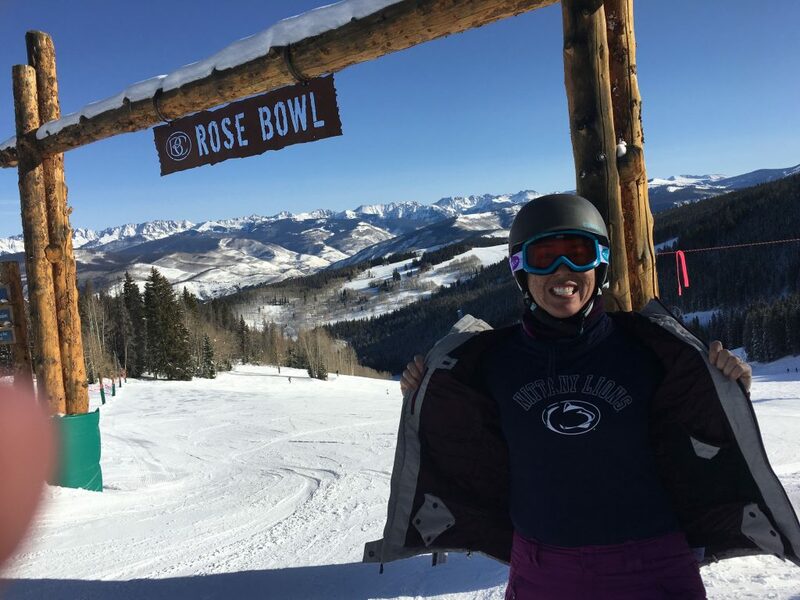 I liked the name and made sure to have my picture taken with my Penn State shirt! 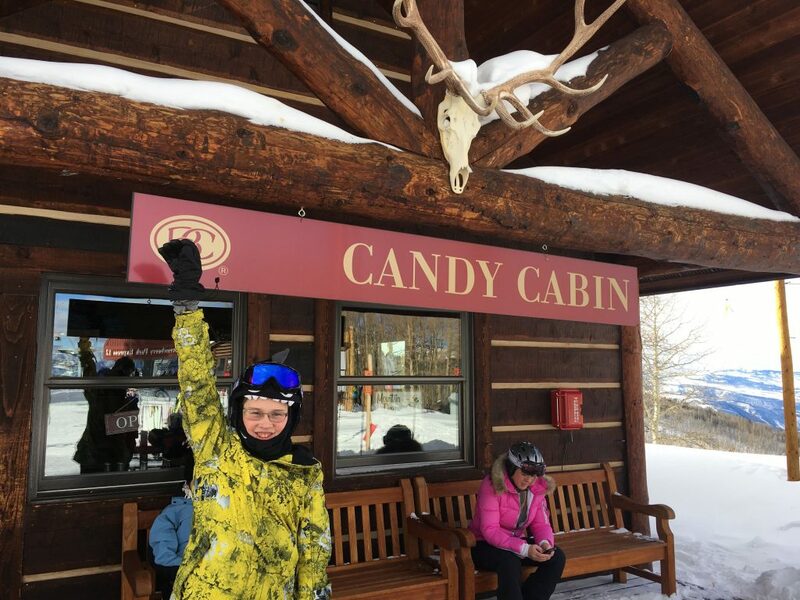 Partway up the mountain, at the top of the “Strawberry Park” lift, is a candy shop. No kidding. I let the kids choose some bulk candy, at the tune of $16 per pound!!!! 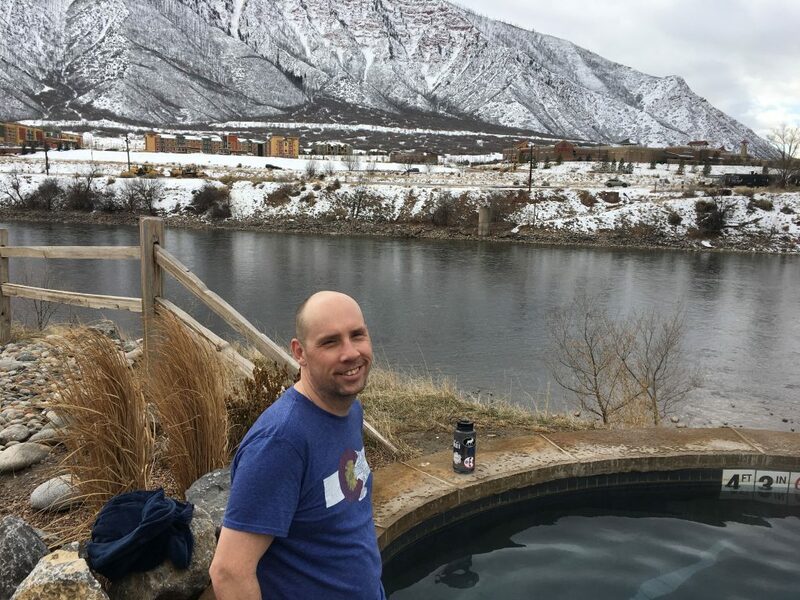 The day after visiting Beavercreek, we drove 45 miles west to the town of Glenwood Springs, known for its warm mineral pools. 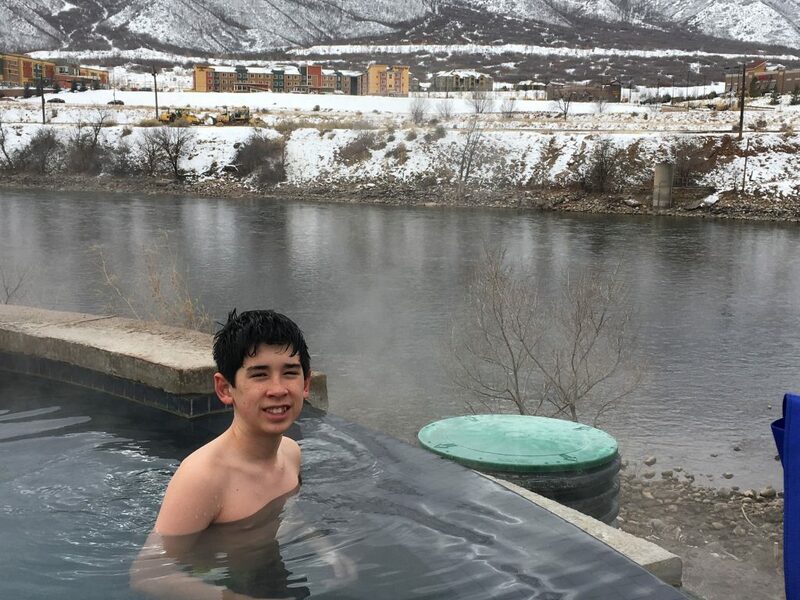 A new facility had opened in 2015 called “Iron Mountain Hot Springs” and we had a very nice time there. The boys really enjoyed the “family pool” that wasn’t quite as hot. 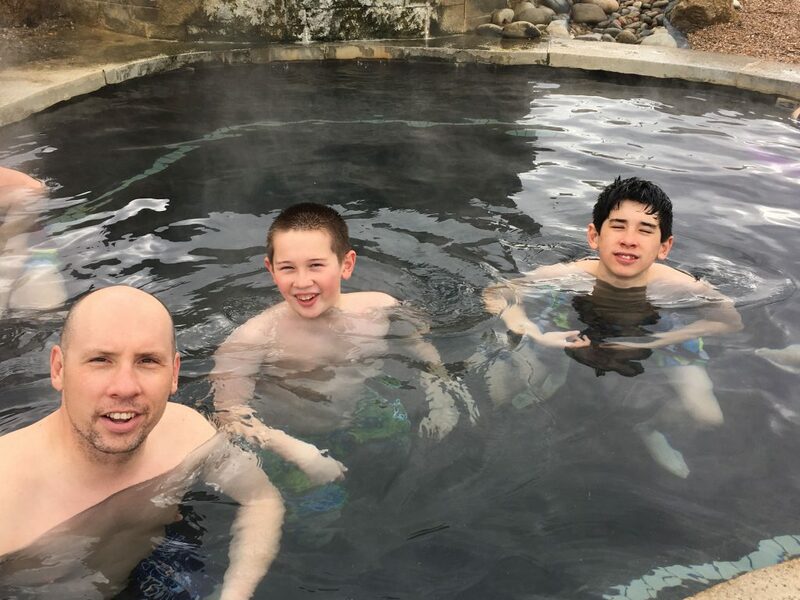 So even though it was December, the boys spent an afternoon playing at the pool…outside! They slept well that night! After our day at Glenwood Springs, I drove the boys out to Copper Resort, separately over two days, which is about 20 miles east of where we were staying. 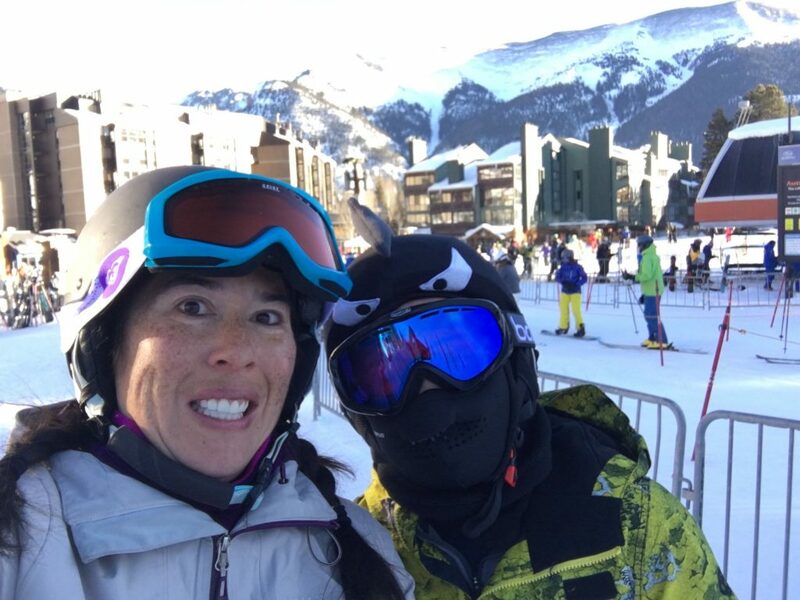 There were a couple reasons for choosing Copper: (1) the boys had skied at Copper a couple times before and were familiar with the mountain and (2) with our Monarch Mountain season passes, we got 3 free days of skiing there this season. On Thursday it was just Jacob and me. Timmy was pretty beat up from playing hard at the pool the day before and asked to hang back. I had to chase Jacob all over mogul-covered trails, phew! Friday was a ski day just with Timmy. While Timmy isn’t into the moguls as much as Jacob, he’s starting to explore terrain parks a little. We are now home from our travels. Dave returns to work tomorrow, while the boys return to school on Wednesday. As for me, I have no full-time work lined up at the moment, although there are a couple leads I’m working that might put me back in the classroom soon! Fingers crossed! I have a few home projects on the docket, but no major home improvements (DIY or otherwise) are forthcoming. Stay tuned for my post about my new toy: The Instant Pot!